Ryan Strome finally will make his NHL debut for the Islanders on Thursday at Phoenix. The Islanders continue to lose games. They fell in Anaheim 5-2 last night sending them to their 10th consecutive loss. During the awful stretch they’re 0-8-2 and have been outscored 43-16. John Tavares and Thomas Vanek scored both goals and each had an assist in a losing effort. Twice, the Isles led by a goal before a Duck onslaught in which they scored four unanswered. That included two goals in the final 33 seconds which doomed the Isles. First, Cam Fowler scored shorthanded by finishing off a three-on-one. Then, Corey Perry scored a highlight reel goal from his knees banking the puck off Travis Hamonic past Anders Nilsson with 1.7 seconds left. Just like that, the Islanders trailed 4-2. Instead, Perry added his 20th goal on the power play to close the scoring. The lack of offensive depth has become a problem for the Islanders. Tavares, Frans Nielsen and Kyle Okposo haven’t got any help. Since coming over from Buffalo, Vanek has five goals and six assists in 15 games. Remarkably, his 11 points tie him with Andrew MacDonald for fourth in team scoring. Josh Bailey hasn’t taken the next step with four goals and six assists in 30 games. Michael Grabner has only two goals in 28 games. Both were expected to be key contributors. Prior to last night’s game, the Islanders waived Pierre-Marc Bouchard. Brought in to replace Brad Boyes (8 goals), he has four goals and five assists in 28 contests. The veteran forward cleared waivers and will report to Bridgeport. Is Peter Regin (1-3-4) next? By admitting a mistake, the Isles are expected to give rookie center Brock Nelson additional ice-time. In 21 games, he has three goals and five helpers. In addition, the organization finally recalled top prospect Ryan Strome. 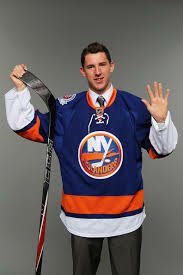 The former 2011 first round pick is leading the Sound Tigers with 33 points (9-24-33). Selected fifth overall in the ’11 Draft, the 20-year old is considered an elite prospect. A very gifted scorer with tremendous speed and touch, Strome won’t debut until the Isles are in Phoenix Thursday. The club takes on San Jose later tonight. Another Western power capable of exploding. Newsday’s Arthur Staple clarified why he’ll have to wait two days. Plan now is for Ryan Strome to meet #Isles in PHX tomorrow. Weather trouble and team didn't want him to fly all day then play. To clarify: #Isles were at roster limit, so Strome could not travel until official recall. At the very least, the Islanders just became a lot more interesting. It’s time to find out what Strome can do. Following Thursday’s game in the Desert which concludes a five-game road trip, they return to Nassau Coliseum to host Montreal Saturday on Hockey Night In Canada. That should be eventful. Strome represented Team Canada at the U-18 World Junior Championships in 2012 and 2013. He posted nine points (3-6-9) in ’12 and six points (4-2-6) last year. The Canadian audience will have a curious eye on Strome. This entry was posted in Battle News, NY Islanders. Bookmark the permalink.